LOVE WATERMELON? 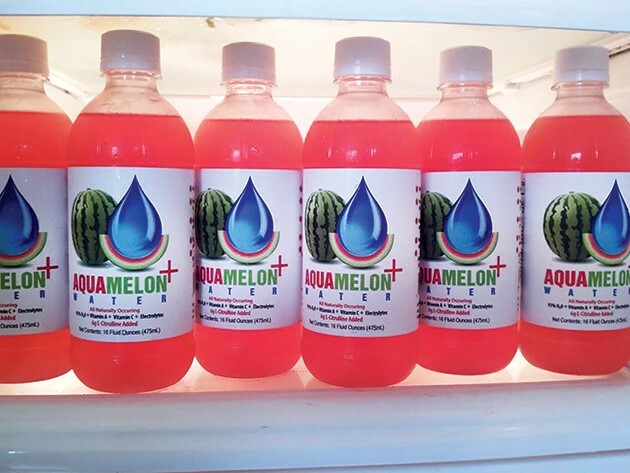 YOU’LL LOVE AQUAMELON WATER! - What About Watermelon? You are here: Home / Nutrition / LOVE WATERMELON? YOU’LL LOVE AQUAMELON WATER! In July, I wrote about Tsamma juice, a watermelon-based drink that aimed to finally put watermelon juice on the fruit juice map. Today, I’m excited to announce yet another refreshing option called AquaMelon Water. The drink was created by Desmond Williams, a business administration graduate student at the University of South Florida’s Center for Entrepreneurship. Williams is a runner, who puts wedges of watermelon in his freezer for a post-run snack. That simple idea was the inspiration behind AquaMelon Water. But Williams also discovered a University of Florida study that gives the drink some very real health benefits. Results from the 2010 study showed the ability of watermelon juice to decrease blood pressure in some people, thanks to the amino acid, citrulline, found in watermelon juice. With a great idea in place, Williams entered AquaMelon Water in start-up business competitions, with the goal of winning enough money to take the product to production. And, wouldn’t you know it, his idea was a winner! AquaMelon Water won the USF Fintech Business Plan Competition (and a $20,000 prize) and was runner-up at the Florida Venture Forum. So what’s the future hold for AquaMelon Water? Time will tell, but I really hope to see it on shelves at my local grocery store soon!